The sequel of the Vivo XL2 is finally available for purchase in the United States, in case you were looking for a mid-range Oreo-powered smartphone priced at less than $200. Although it packs mid-range specs, the BLU Vivo XL3 promises to offer a premium feel design-wise. 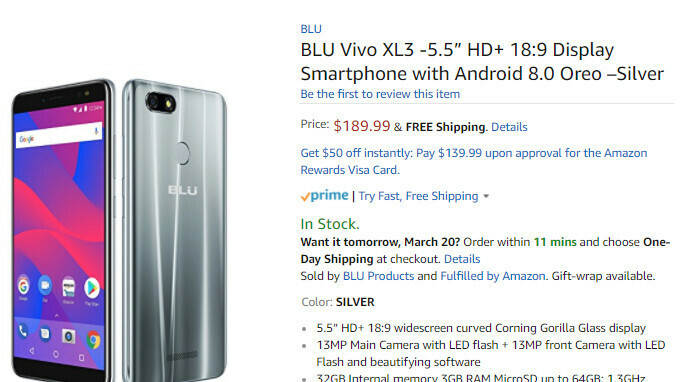 Amazon has the BLU Vivo XL3 smartphone up for purchase for $190 (free shipping included), a decent price for what it has to offer, at least on paper. Before talking about the insides of the handset, it's worth noting that the phone features a metallic finish that incorporates a so-called “electrolyzed metal” effect. BLU has embraced the 18:9 display trend a long time ago, so it's no surprise that the Vivo XL3 includes a 5.5-inch HD+ screen with 18:9 aspect ratio. On the inside, the phone packs a 1.3GHz octa-core MediaTek 6737 processor, 3GB RAM and 32GB expandable storage. As the title says, the Vivo XL3 runs Android 8.0 Oreo right out of the box. Also, it's powered by a decent 3,000 mAh battery and has 13-megapixel cameras on the back and front sides. On top of that, the smartphone benefits from BLU's new facial recognition technology, which allows users to gain access to their Vivo XL3 phones in a matter of seconds. BLU Vivo XL3 comes unlocked and it's fully compatible with GSM networks including AT&T, T-Mobile, Cricket, MetroPCS, and Straight Talks. For $189...Profiting less than $50 per unit isn't a great business decision. These are considering disposable devices. These aren't meant for people to keep for 2-3 years. At the very least where are the software updates and better yet if you have any issues where do you turn to? Exactly my thoughts. You get what you paid for. I bet they use B grade materials aka leftovers that didn't pass quality test, then slap them together, get some trendy feature on and job done. Minimal software update if any and you have half baked device. PA gets a cut from that too :) Cosmin probably gets a cup of coffee on the house . After all the bad press they gathered during the last past few years, I'll pass Blu phones. Sparkxster said not to trust BLU phones. That is a dumb thing to state and unsubstantiated, at least within that warning. I have been buying BLU phones since they have been available in the States because I didn't want to have a contract, so I needed to find an unlocked phone and a company that would let me bring an unlocked phone. That was 6 years or so ago. Not many phones or companies met my preferences except the BLU phones and Consumer Cellular. I have had a few BLU phones, only changing when I wanted a bigger one, or a back-up phone, more memory or more storage capacity, etc. I did return one, once, because the outgoing audio was very poor. Please note that I didn't buy the BLU phones under $100. In fact, I usually pay $170 to $250+ to get the features I want. Maybe the harsh warning not to buy BLU phones was due to purchasing only their $65 phones?